Lens Description: The Tamron AF 55-200mm f4-5.6 Di II Macro LD (Model A15) is a tele-zoom lens designed exclusively for digital SLR cameras with smaller-size image sensors at an affordable price. Di (Digitally integrated)-II lenses are designed for exclusive use on digital cameras with smaller-size imagers. 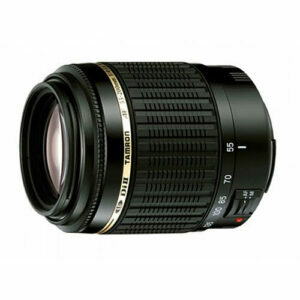 This lens is not designed for use with 35mm film cameras or digital SLR cameras with image sensors larger than 24mm x 16mm.For photographers who bought their digital SLR camera in a kit with a standard zoom lens but are dissatisfied with the telephoto capability of the standard lens, the AF55-200mm f4-5.6 Di II LD Macro offers in a second lens a desirable telephoto range at an affordable price. The tele-zoom from Tamron will allow these photographers to enjoy the telephoto capabilities that yield dynamic images in many photographic situations including sporting events, large wildlife, scenery and portraiture.